Children's Christmas costumes are mostly used for church pageants, but there might be other parties during the holiday season where a costume is appropriate. The tradition, of course, is to make a costume, but for those who have neither time nor sewing skills, there are plenty of ready-made costumes from which to choose. There can also be more secular Christmas events involving Santa Claus. While children can and do dress up as Santa and Mrs. Claus, it's most common to have adults take these parts and to have children dress as elves - a natural fit, since elves are meant to be small. Children might also dress as reindeer. 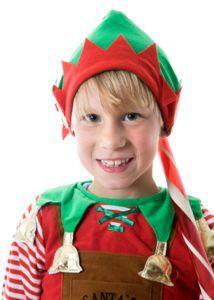 The sort of children's Christmas costumes of which many children dream is what they wear as part of a performance. In Britain, the time-honored tradition of Christmas pantomimes, both for performing and attending, is a rite-of-passage for all young theatre students. The costumes worn here, however, are from the story (usually a fairy tale) being told, and are not "Christmassy". Even for children who are not performing, the lure of the Nutcracker characters has made some of the costumes available just for fun - a child may wish to dress up as the Sugar Plum Fairy at a party, for example. Some ballet-crazy children not performing might go to the ballet in a Victorian costume, perhaps carrying a small nutcracker, the better to feel part of the action. Whatever the event, you can easily buy Christmas costumes from most online costume shops, or a well-stocked shop in your neighborhood. Most shops will start stocking new costumes as early as November 1. There are also a number of assorted costumes for a nativity scene, but most of these costumes are easy to make at home or as part of a church activity. Churches that stage a child-oriented pageant every year will often have costumes on hand. Christmas costumes are far more common outside of performing venues than they once were. There are many parties where a costume is appropriate. As with Halloween, it's best to let the child choose a costume. In this case, it's less about representing a character than embodying the spirit of Christmas as they see it, making it even more valuable as a choice. Whatever they choose, since most of the costumes are so simple to make - and can be fun, as well - try to find time to turn the costume into a family activity. You'll find it's an excellent way to really get in the spirit of the season!